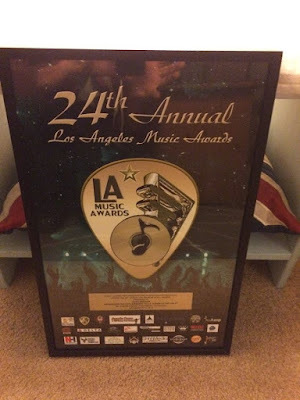 In 2014 I was nominated for two Los Angeles Music Awards: Rock Album of The Year (Bridgework "Every Now And Then"), and Guitarist of The Year. I didn't win either. However, I was the recipient of a Producer's Choice Award. Originally they wanted to call it "Studio Album of The Year" but I had to explain to them that there was no studio. I did it all myself. So the "DIY Album of The Year" was born. This now holds a place of honor on my bathroom wall.